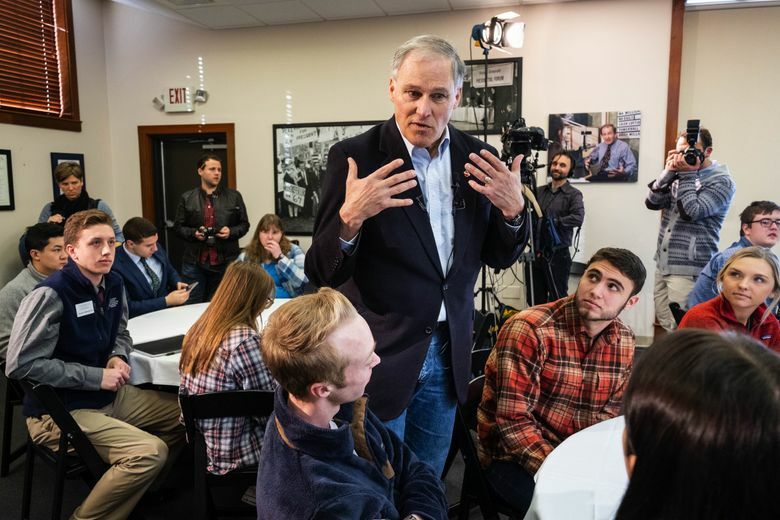 Speaking to about 40 students, with local and national media watching, Inslee said the fight against climate change is both a peril and an opportunity for a clean-power-fueled new economy. MANCHESTER, N.H. — Sounding very much like a presidential candidate, Gov. 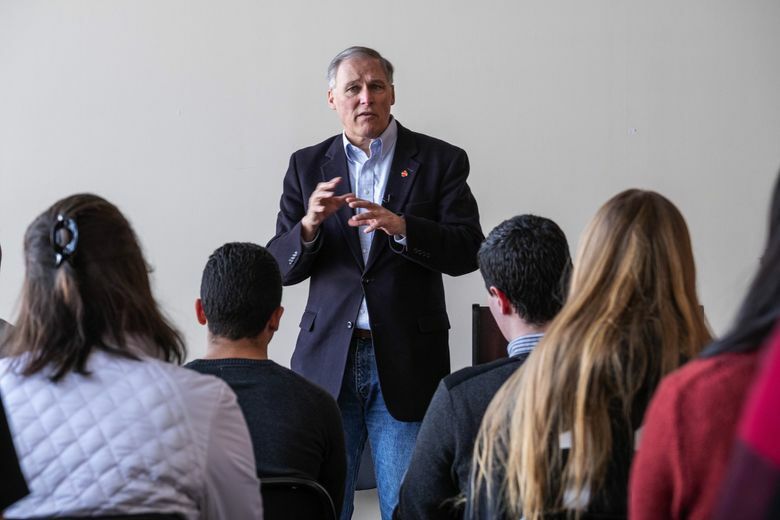 Jay Inslee spent Tuesday previewing a 2020 campaign focused on fighting climate change, making his case to students at two private colleges in the state that holds the first-in-the-nation primary. 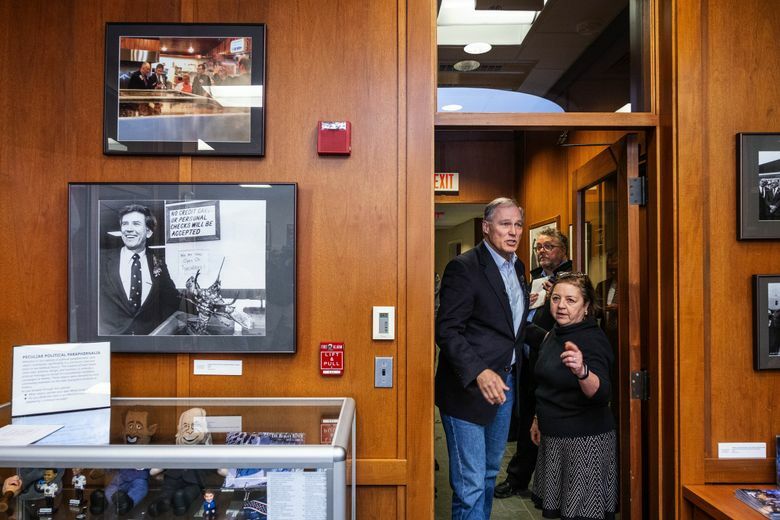 Entering his Tuesday morning appearance at Saint Anselm College’s New Hampshire Institute of Politics, Inslee paused in a corridor to eye a photo of former President Jimmy Carter visiting Robie’s Country Store before the 1976 primary, from which the ex-Georgia governor emerged a surprise winner. “Funny, a small state governor with no name ID became president of the United States. Isn’t that strange? I wonder how that could happen,” Inslee quipped. 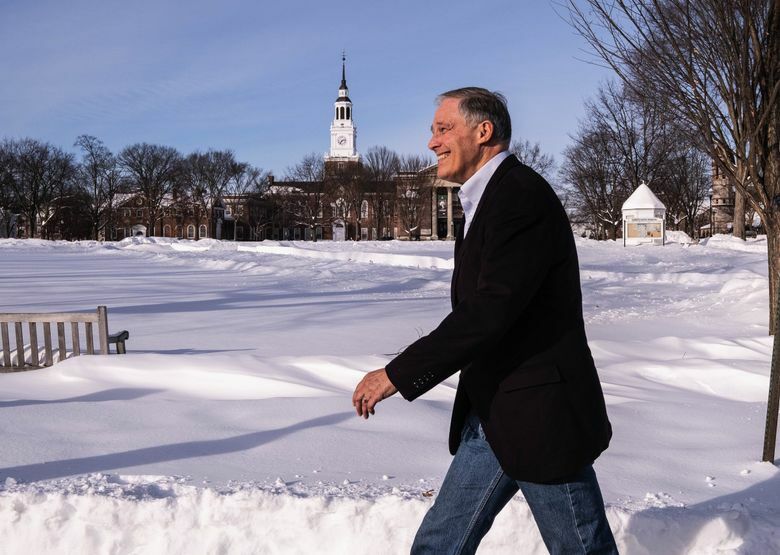 In talks at Saint Anselm and later across the state at Dartmouth College in Hanover, Inslee urged the few dozen students at each event to join him in insisting the next Democratic presidential nominee makes climate a top priority. “We know we have to essentially decarbonize our economy. 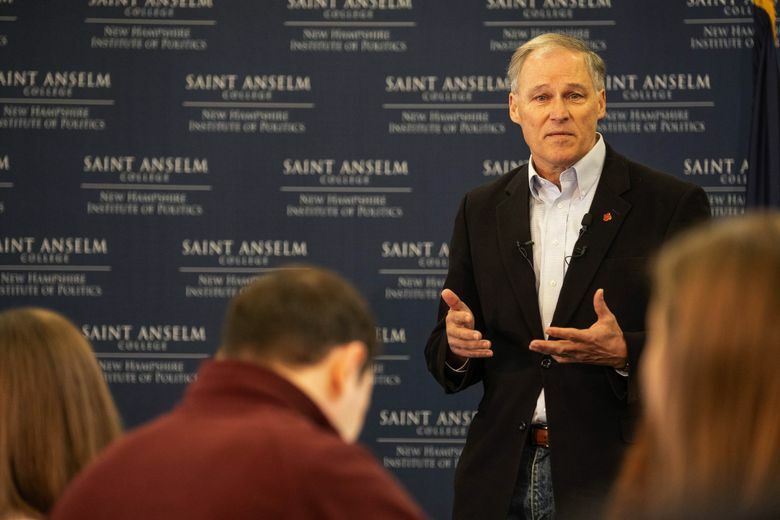 We know we have to stop being slaves to the oil and gas industry,” Inslee said at Saint Anselm, dressed casually in bluejeans and a dark blazer, sporting an apple pin. 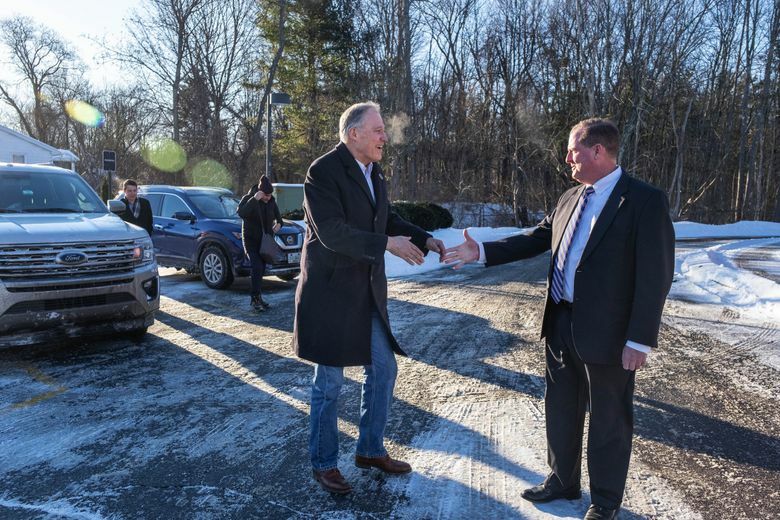 Inslee’s New Hampshire talks were part of a three-day political trip amid a frigid winter storm that canceled one of his flights and upended some scheduled appearances. His time in the Granite State was bookended by stints in New York City for TV interviews and talks with potential campaign staffers and supporters. 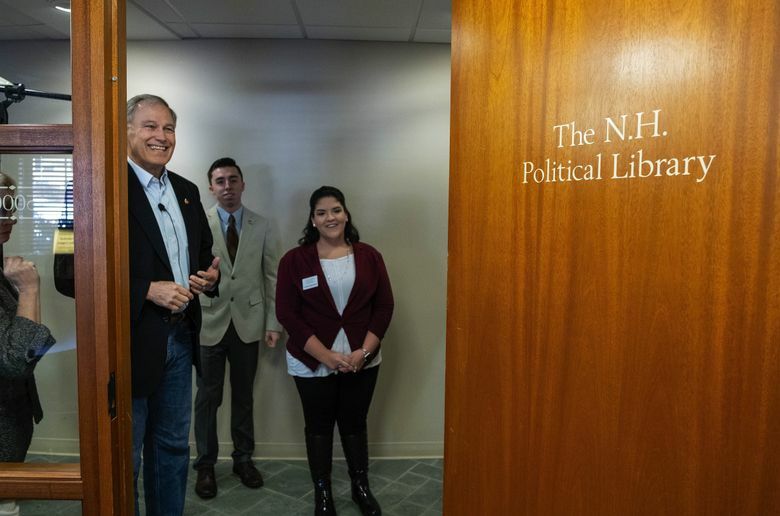 During his public speeches, Inslee did not lay out a detailed platform he might propose if he enters the presidential race, and he declined, in response to a student question, to endorse a national carbon tax or cap-and-trade mechanism for making fossil fuels more expensive. He, instead, emphasized a clean-energy economic-growth message he said could appeal to voters from the Midwest to the coasts. Inslee’s rhetoric left little doubt of his intentions, said Christopher Galdieri, an associate professor of politics at Saint Anselm. “You don’t come to New Hampshire to tell a bunch of college students about your four-point plan on climate change if you are not running,” he said. Galdieri said Inslee, like other lesser-known candidates, will face difficulty emerging from a pack of better known Democratic contenders who already have entered or are likely to enter the race, but he said Inslee’s climate-change emphasis could resonate with younger voters. Some students who watched Inslee said they appreciated his climate focus, though they’re not sure who they will support in 2020. 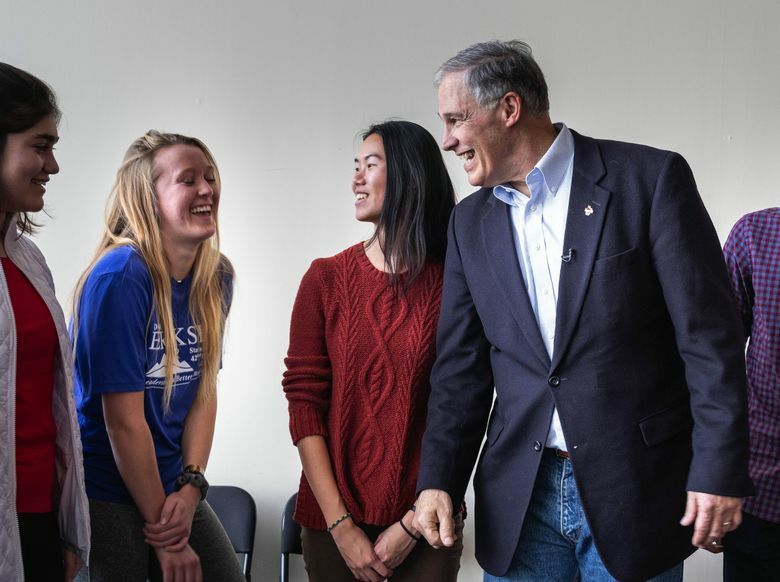 At his Dartmouth event later in afternoon, Inslee and political aides chowed on pizza with students and met with some in a small group before his larger talk. Gigi Gunderson, a sophomore and president of the Dartmouth Democrats, the group that invited Inslee, said she was impressed. “It was one of the most refreshingly authentic conversations I have had with a political person in a long time,” she said. However, one student with Washington roots at the event wasn’t sold. In a small-world moment, Elsa Ericksen, a Dartmouth freshman, showed up wearing the campaign T-shirt of her father — state Sen. Doug Ericksen, R-Ferndale, a longtime Inslee critic and oil-industry ally who has opposed the governor’s climate agenda. A smiling Inslee and Elsa Ericksen posed for a photo together. Inslee jokingly said he was confident she would bring her father over to his side. 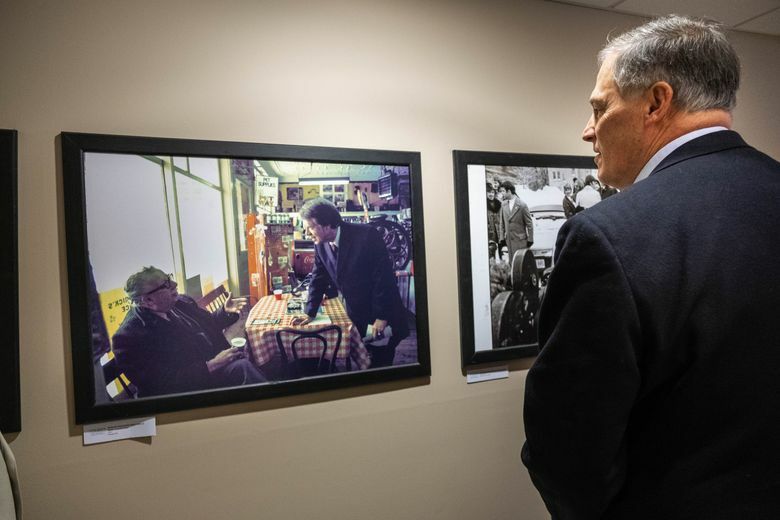 As he approaches a decision about his political future, Inslee has faced criticism back home about his national travel schedule, which began heating up last year during his stint as chair of the Democratic Governors Association. The travel costs for the governor and two political aides who accompanied him to New Hampshire were borne by a federal political-action committee, Vision PAC, he formed late last year to explore a possible presidential bid. However, taxpayers are bearing the expenses for the State Patrol security detail that accompanies the governor wherever he travels. Three members of the patrol’s Executive Protection Unit (EPU) accompanied Inslee on the trip. The Seattle Times and Northwest News Network reported in November that Inslee’s intensifying, out-of-state travel had caused the EPU to overspend its budget, largely because of overtime and travel costs for the troopers. The patrol has requested a $1.3 million budget boost to cover such costs over the next two years. 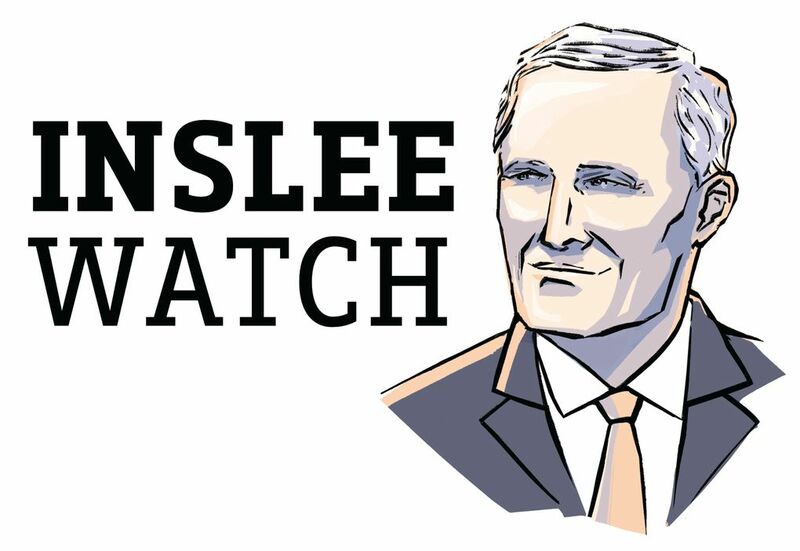 “Inslee’s passion for personal political gain exceeds his desire to govern our state. In fact, not even a winter storm will stand in his way as he travels the country attempting to appease the far-left base with resistance and obstruction,” Heimlich said. Asked how he would respond to Washington residents who wonder if his pursuit of higher office is interfering with his job as governor, Inslee argued he’s been performing his duties, pointing to recent slates of legislative proposals on orca recovery, health care and climate change. “I feel confident in my ability to do this. We have kind of been doing this for a couple months and we’re rocking and rolling in Washington state,” he said. While openly eyeing the White House, Inslee has not ruled out running for a third term as governor in 2020. 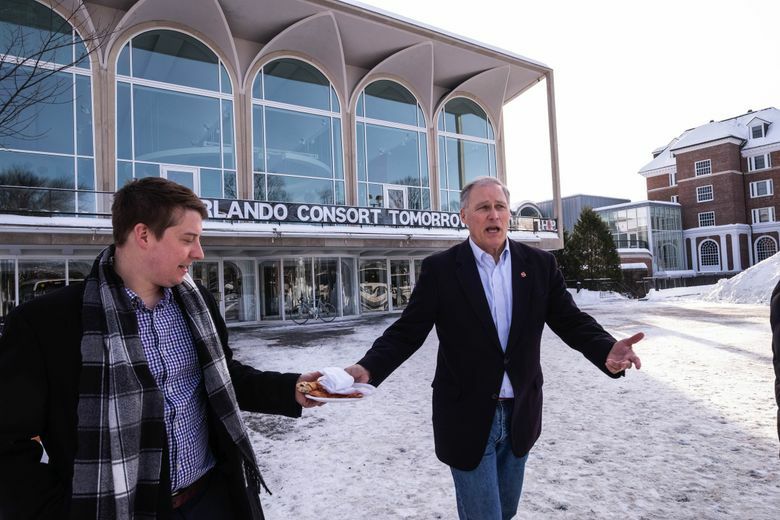 Inslee’s travel schedule this week was complicated by a frigid winter storm that struck the Northeast, with temperatures Monday hovering at zero degrees — reaching -20 degrees and colder with wind chill. The icy conditions forced cancellation of the governor’s scheduled flight from the New York area to Manchester, leading Inslee to miss an appearance at a fundraiser for the League of Conservation voters at the home of former Rep. Paul Hodes. 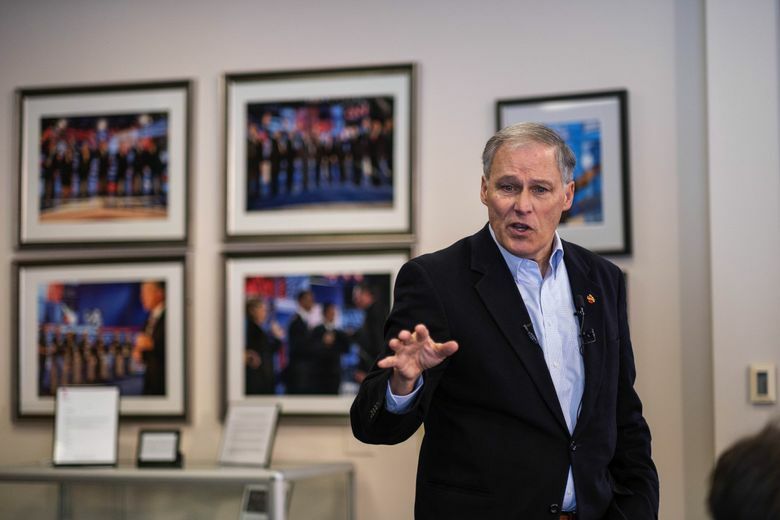 The governor and his entourage drove the four-plus hours from New York to New Hampshire on Monday night, pulling off the side of the road to talk via Skype with attendees at the fundraiser, according to Jamal Raad, Inslee’s political spokesman. Inslee was scheduled to return to Washington state on Wednesday. He has no additional out-of-state political trips planned at the moment, Raad said.